LeishGEdit (Leishmania Genome Editing) is an online resource for CRISPR Cas9 genome editing in Leishmania mexicana and other kinetoplastids. On this site you can find plasmids and retrieve primer sequences to target (tagging and/or knockout) your gene of interest. You want to learn how it works? CRISPR workshop for students from neglected disease endemic countries and the UK: 2nd Advanced School in Genetic Manipulation of Parasitic Protozoa in Rio. Apply by 30th April. Click on the link for course details! What is new on LeishGEdit? 23 Nov 2018: Our latest manuscript "Genetic dissection of a Leishmania flagellar proteome demonstrates requirement for directional motility in sand fly infections" is now available for download. We use the power of our CRISPR-Cas9 toolbox to generate a knockout library of 100 mutants. We screen mutants for flagellar defects and use a simple barcode sequencing (bar-seq) method for measuring the relative fitness of L. mexicana mutants in vivo. Get it under: bioRxiv! 02 April 2018: Our CRISPR Cas9 toolkit works also great in T. cruzi. Check out our latest publication (Expanding the toolbox for Trypanosoma cruzi: A parasite line incorporating a bioluminescence-fluorescence dual reporter and streamlined CRISPR/Cas9 functionality for rapid in vivo localisation and phenotyping) in collaboration with John Kelly's and Martin Taylor's laboratory. 29 November 2017: Our CRISPR Cas9 toolkit works also great in L. donovani. Check out our latest publication (Characterisation of Casein Kinase 1.1 in Leishmania donovani Using the CRISPR Cas9 Toolkit) in collaboration with Gerald Späth's laboratory. 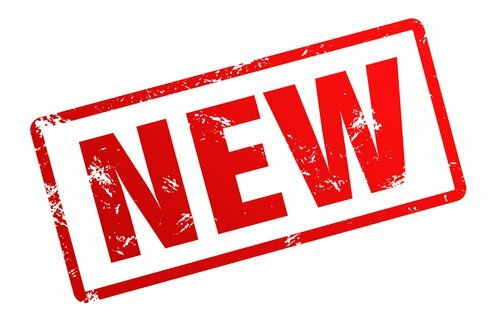 03 April 2017: From today new tools on LeishGEdit are announced here! Please contact Dr. Eva Gluenz (eva.gluenz@path.ox.ac.uk) or Tom Beneke (tom.beneke@path.ox.ac.uk) to request plasmids and for technical advice on primers, plasmids and cell lines. Please visit our lab website, if you have further interest in our research. Please cite our main publication for using our website and method in any given organism: Beneke T., Madden R., Valli J., Makin L., Sunter J. and Gluenz E (2017). A CRISPR Cas9 high-throughput genome editing toolkit for kinetoplastids. Royal Society Open Science 10.1098/rsos.170095. Additionally we would like to ask you to cite Martel et al., BioMed Research International 2017 for publications in L. donovani and Costa et al., PLOS NTD 2018 for publications in T. cruzi when using our CRISPR Cas9 method. We would like to thank Duo Peng (EuPaGDT) for giving access to a multithreaded batch mode to design sgRNAs, Samuel Dean for providing pPOTv4 plasmids and Andy Bassett for CRISPR advice. The development of these tools was funded by the Wellcome Trust, the Medical Research Council (MRC), University of Oxford John Fell Fund and the Royal Society. 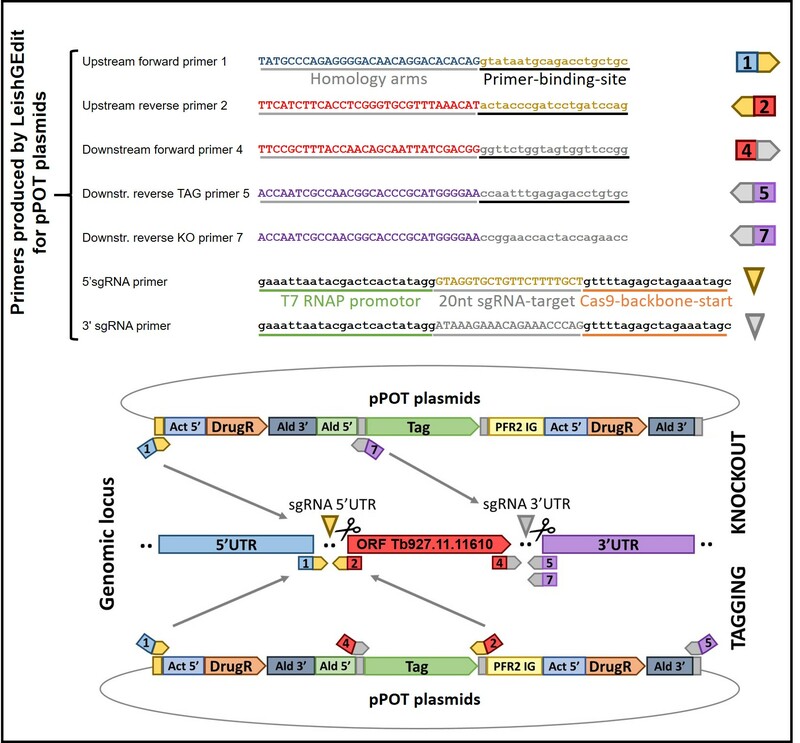 With pPLOT / pT plasmids, which are optimised for gene expression in Leishmania spp., you can insert protein tags at the 5'- or 3'-end of a gene of interest or knock out a specific gene or locus in a kinetoplastid expressing Cas9 and T7 RNAP. For knockouts and protein tagging in Trypanosoma spp. we recommend using pPOT plasmids (please contact Samuel Dean for plasmids1). Please note, pPOT plasmids are not optimised for use in Leishmania. LeishGEdit has to date 122,170 primer sequences available for free. Please cite our website and publication (Beneke, Madden et al., 2017) so that we can continue this resource for the kinetoplastid community. Please use the form below to retrieve your primer sequences for pT and pPLOT plasmids or pPOT plasmids. Although there is no input limit, we recommend that you use the Excel sheets below for queries larger than 1000 genes. Please note that there are no pPOT primers available for Leishmania species as explained above. You can export your designed primers as a '.csv' file on the search result page. The common sgRNA scaffold primer is described in our publication (Beneke, Madden et al., 2017) and should be used for sgRNA template amplification. You can download the sequence here: G00. The sgRNA primers contain the highest scoring 20nt guide RNA sequence the EuPaGDT CRISPR gRNA Design Tool identified within 105bp upstream or downstream of the target gene. Primers for amplification of the targeting cassettes contain 30nt of sequence immediately adjacent to the sgRNA target sequence. These are the 30nt homology arms for recombination. Shown below is a primer design example for N-terminal tagging of gene Tb927.11.7830. 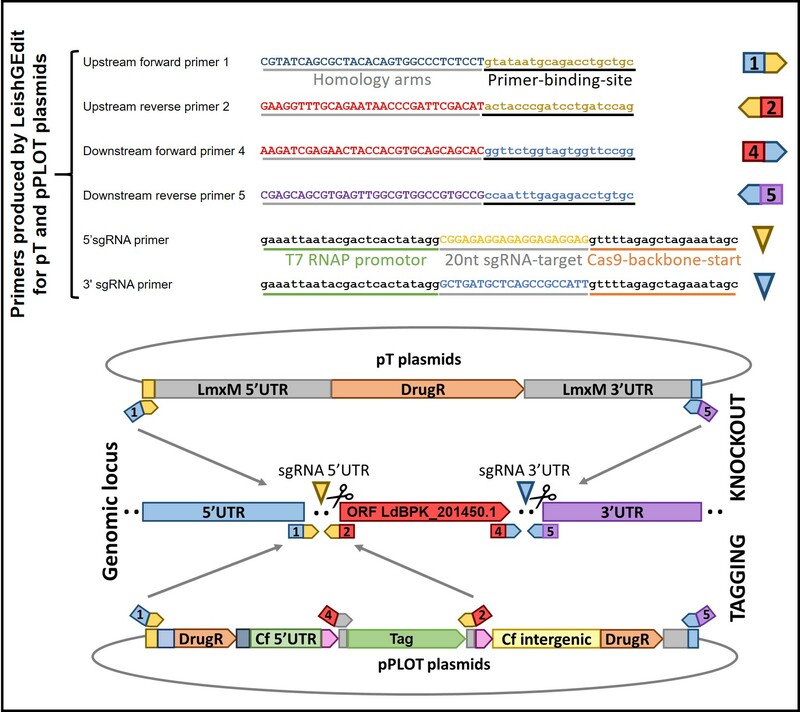 Understanding the output for "Tagging and knockout"
"Upstream" and "Downstream" primers produced by LeishGEdit primer-design contain primer binding sites compatible with pT, pPLOT and pPOT plasmids; as well as 30nt homology arms for recombination. "sgRNA" primers consist of a T7 RNA polymerase promotor (for in-vivo transcription of RNA), a 20nt sgRNA target sequence to indroduce the double strand break at a locus of interest and a 20nt overlap to the CRISPR-Cas9 backbone sequence allowing generation of sgRNA templates by PCR (follows the protocol published by Bassett and Liu, 2014). Shown below on top is a primer design example for tagging and knockout primers of gene LdBPK_201450.1. with pT and pPLOT primers. A primer design example for tagging and knockout primers of gene Tb927.11.11610 with pPOT primers is given on the bottom. 1 pPOT plasmids from Dean, S., Sunter, J., Wheeler, R., Hodkinson, I., Gluenz, E., Gull, K (2015). A toolkit enabling efficient, scalable and reproducible gene tagging in trypanosomatids. Open Biology 5:140197. 2 Gene models from Fiebig, M., Kelly, S., Gluenz, E (2015). Comparative Life Cycle Transcriptomics Revises Leishmania mexicana Genome Annotation and Links a Chromosome Duplication with Parasitism of Vertebrates. PLoS Pathogens II:e1005186. 3 The genome of Leishmania braziliensis MHOM/BR/75/M2903 was sequenced by the the Genome Center at Washington University School of Medicine. Pre-publication access is a courtesy of Stephen M. Beverley. Plasmids below are available on request. You can find a detailed describtion of LeishGEdit in Beneke, Madden et al., 2017. For technical advice on primers, plasmids and cell lines please contact tom.beneke@path.ox.ac.uk or eva.gluenz@path.ox.ac.uk. Please note, due to the high number of requests, we are only shipping plasmids every first and third Monday of a month. The common sgRNA primer G00 will not be shipped. Please order the G00 primer yourself. pPLOT and pT serve as template DNA for PCR amplification of repair cassettes for genome editing by homologous recombination. The amplicons can be transfected together with the relevant sgRNA templates into a kinetoplastid cell line expressing Cas9 nuclease (for example derived from pX330 (Cong et al., 2013)) and T7 RNA polymerase for in vivo transcription of sgRNAs. Alternatively, the amplicons can be transfected together with in vitro transcribed sgRNAs into a kinetopastid cell line expressing Cas9 nuclease. Generation of sgRNA templates by PCR follows the protocol published by Bassett and Liu, 2014. For complementation of knockout phenotypes we recommend integration of an add-back copy of the gene of interest into the beta tubulin locus.